Ahhh Farolito. We've certainly had some good times together, haven't we? Like, that one time I came in drunk just before 2 and ordered a Super Carnitas Quesadilla? 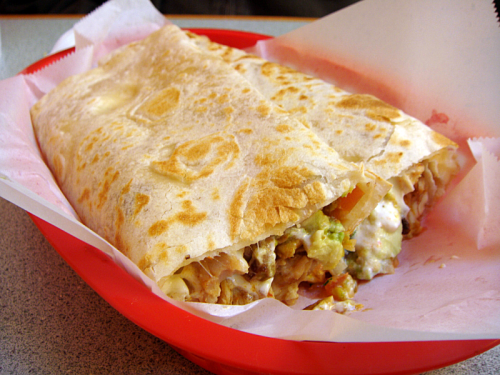 Or that other night when I stumbled in drunk after bar-hopping in the Mission, and ordered a Super Carnitas Quesadilla? And, of course, you can't forget the time when I wandered in drunk on a Saturday and ordered a Super Carnitas Quesodilla. Do you remember that!? Good times my friend, good times. Okay. You get the picture. I never eat here sober. That said, I don't really know that anyone SHOULD eat here sober - I think to truly appreciate the magic that is El Farolito, you have to be sufficiently intoxicated. And frankly, I think my judgment of tacqueria quality improves as my cocktail intake increases. So with that, as far as quesadillas go, I officially decree El Farolito as the 2nd best tacqueria in the Mission - 2nd only to Cancun. Frankly, they're almost exactly the same - huge portions, dripping with gooey cheese, and smothered in avocado and sour cream. The only difference is the carnitas - at Cancun they are thrown on the stove, whereas at Farolito they are kept in a container of meaty juice. The problem is this can make the rest of the quesadilla soggy, and doesn't have the same level of crispy, fried goodness that the other one possesses. But, at the end of the day (or I should say, night), it's still freakin' delicious, and biting into a warm, greasy, gooey serving of happiness is one of the best ways to end an epic night in the Mission.